We are a proudly Australian owned and run, online costume shop, dedicated to providing you with a great choice in costumes for your next event! We understand that last minute costume changes and invitations exist, hence why we offer speedy deliveries via Express shipping (for an additional cover charge) and provide a secure, online shopping experience for all of our customers. 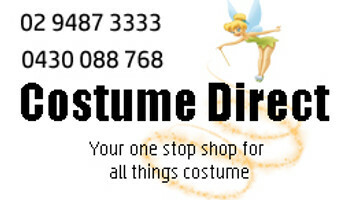 *Costume Direct has recently merged with All Costumes Great and Small, creating the greatest costume supercentre Australia has ever witnessed! Please contact us on (02) 9487 3333 or 0430 088 768 for any inquiries. If you have any questions, suggestions or other feedback please contact us, we would be delighted to hear from you.